After so many light things I thing it’s high time for me to prepare something more elaborated, otherwise you’ll think that all I’m eating is salad. Oh, no, that’s not true at all. Thus being said I will prove you again that I go from one extreme to the other with a dessert for serious chocoholics. That’s because few days ago my family of baking stamps and trays got bigger with a new entry, one I had been looking for a while until I found the right one as they were either too big or too small. This one (the one you see in the picture below) is exactly what I wanted,nor too big, neither too small, 22 cm, non stick and colorful. It’s quite lovely to see it. Well, now that I’ve found it, I couldn’t help myself testing it. My desire to eat some chocolate pushed me to prepare something with a lot of chocolate for truly chocolate lovers. Thus was born a disturbingly delicious cake that cheers you up from the first bite. And as if chocolate wouldn’t be enough, I thought I would like a cream cheese frosting too. Or maybe a chocolate sauce. As I couldn’t make my mind I prepared them both . And it wasn’t such a bad idea as you can see below. I can tell you not only that it looked very good but also that it was quite disturbingly delicious – the cream cheese frosting gives a touch of freshness to the cake which has a moist texture (I hate dry cakes) and a pronounced taste of chocolate and the chocolate sauce takes a simple bundt cake to a next level transforming it into a luxurious dessert. In a medium bowl whisk together flour, cocoa, baking powder and salt; in another bowl put together milk and sour cream. Cream butter and sugar with a mixer until sugar melts and the cream become light and fluffy. Add one egg at a time and then vanilla. Add the flour mixture alternating with the milk one ending with flour and mix at a lower speed. Fold in the ground almond and the chocolate chips. Mix the cream cheese, butter and vanilla until combined. Add the sugar and mix until smooth and fluffy. Spread the frosting onto the cold cake. Pour the cream into a sauce pan and add the chocolate cut in pieces. Add the rum and whisk again to amalgamate the sauce. Pour into a cup whisking every now and then until cold and drizzle on top of the cream cheese frosting. You can use the rest of it when you serve the cake. Garnish with chocolate chips and serve. As you can imagine I used both the cream frosting and the chocolate sauce and then I decorate the cake with few chocolate chips. What can I say? You do not have to do this at home unless you are real chocolate lovers! The texture is perfect and the taste is divine. 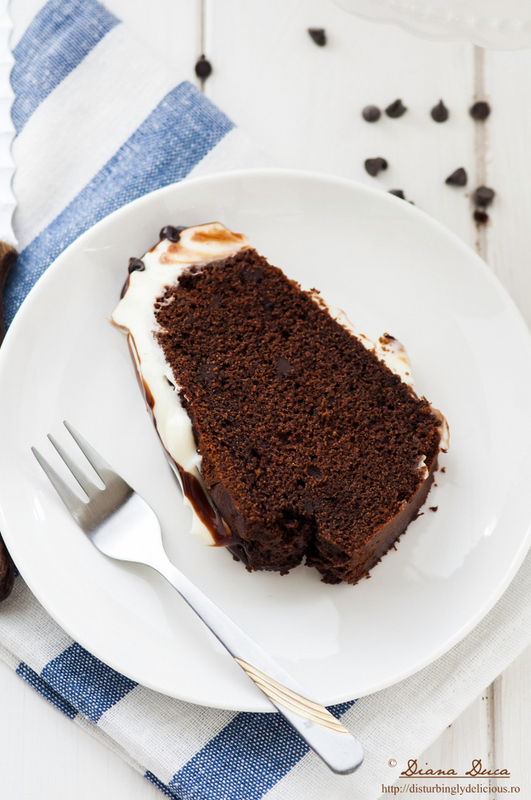 You feel the chocolate sauce melting in your mouth together with the cream cheese frosting paired perfectly with the rich chocolate cake. Bite after bite you will crave for more. 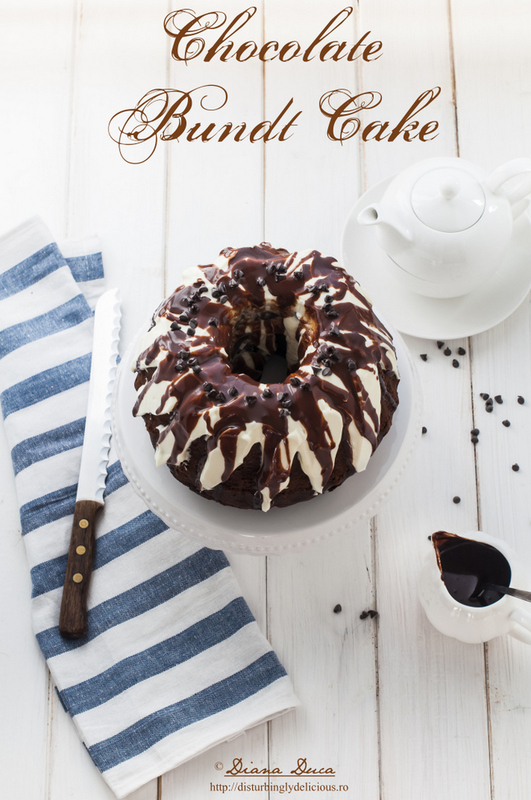 This chocolate bundt cake is by far one of my favorites! After all this happiness given by an extra portion of chocolate I have something for you, my dear friends. 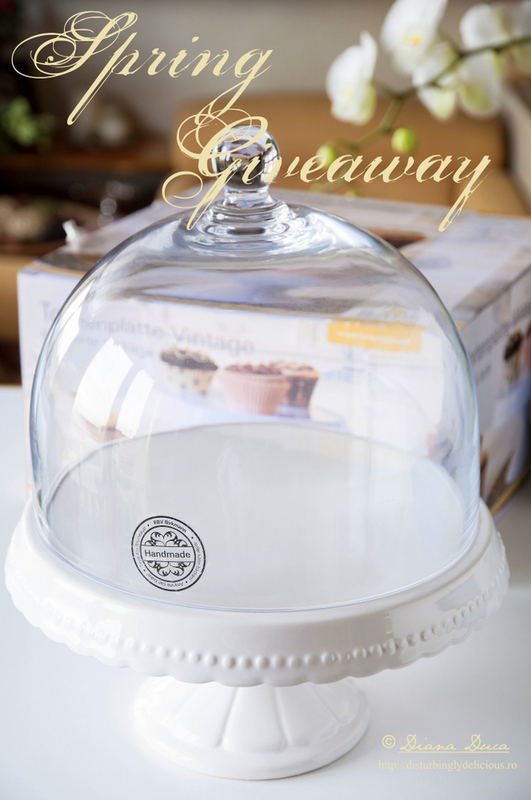 I cannot send you a chocolate cake, but, together with Cakemart we can send you a cake stand like the one I have (the one you can see in the photo below- more exactly a handmade cake stand in white ceramics, RBV Birkmann, with a diameter of 23 cm together with its glass cover) . Visit Cakemart online store and choose a product you like. Visit Disturbingly Delicious page on Facebook (if you don’t follow it yet now it’s the right time to LIKE it) and SHARE the image with the link to the giveaway on your wall or your page on FB ( make sure you have a public profile) – tag me or my page (Disturbingly Delicious) on your post. I am waiting for your answers until Saturday, 14.03.2015 by 23:59 PM. The lucky one will be chosen by using random.org and announced on Sunday , 15.03.2015. "I'm Diana. Food lover. Wine drinker. Diet hater. Good literature reader. Good music listener. Cartoon and avid thriller watcher ( I know, a bit of a contradiction but hey, we all have our sins). Time enemy. Occasional traveller. Workaholic. Animal lover. Owner of a naughty Chartreux. " Welcome to my playground and enjoy your staying! Prajitura ta m-a facut sa inghit in sec, mai ales ca acum iti scriu dintre un robot si un morman de farfurii :)) deoarece zugravim bucataria (cate oale am ars eu cu ochii prin bloguri, nu vrei sa stii ). Si mie imi plac ustensilele vesele de bucatarie si daca se poate sa aiba si floricele, da! Acum site-ul Cakemart este blocat, nu vad imagini, voi reveni cand pot. 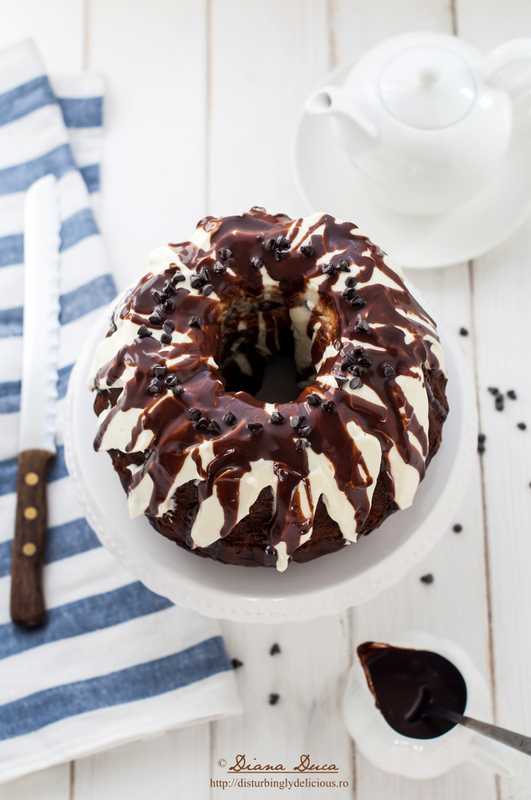 Wow, e superb Bundt cake-ul tau, cu siguranta il voi face si eu curand, cred ca e mega-delicios ! Ce premiu frumos ai pregatit pentru noi! Eu iti vizitez zilnic site-ul pentru ca ai niste prezentari super, super frumoase, iar retetele sunt de-a dreptul delicioase! Standul l-as folosi pentru prajitura “Deliciu”, pe care o prepar frecvent. Like la pagina ta am dat de pe profilul Maria Udrea, dar si de pe pagina de blog: Merisor si retetele ei. Pagina Cakemart am apreciat-o de pe profilul Maria Udrea. Cat despre ce produs as alege de la ei, cred ca tare mi-ar placea o torta: http://www.cakemart.co.uk/baking-equipment-tools/blow-torch-caramalisation/staedter-caramello-gas-burner-blowtorch.html care sa ma ajute sa finisez tarta cu lamaie si bezea pe care mi-o imaginez pe acest stand. Ce premiu grozav!!! ;;) Chiar imi doream de mult un astfel de stand, cred ca ar arata grozav alaturi de prajiturile mele super ciocolatoase. Nu am folosit niciodata un astfel de aparat, insa cred ca este foarte util in orice bucatarie, tocmai de aceea mi l-as dori: http://www.cakemart.co.uk/baking-equipment-tools/kitchen-appliances-specific-appliances/bestron-cake-pops-doughnuts-and-cupcakes-maker-3-in-1.html. Daca as castiga premiul, prima prajitura pe care as urca-o pe “tron” ar fi clar Mississippi Mud Cake. As folosi standul pentru reteta de tort cu morcov si glazura de bezea. Ar fi minunat acest premiu! Chiar mi-as dori sa castig un asemenea stand. As expune un tort cu mousse trei feluri de ciocolata! P.S. De-abia astept sa castig! As folosi suportul la nunta mea ,la un candy bar si probabil as pune niste cupcakes pe el ! P.P.S. Suportul l-as folosi pentru niste mini tarte cu ciocolata. Hm…la ce as folosi standul? Cu siguranta la briose, orice fel de briose frumos colorate. O primavara frumoasa iti doresc! Greu de ales, site-ul e foarte tentant. Pt stand m-am gandit la tortul pe care urmeaza sa-l fac in weekend pt ziua mea. Banana cake cu chocolate frosting. Numele si mailul le-am lasat mai sus. 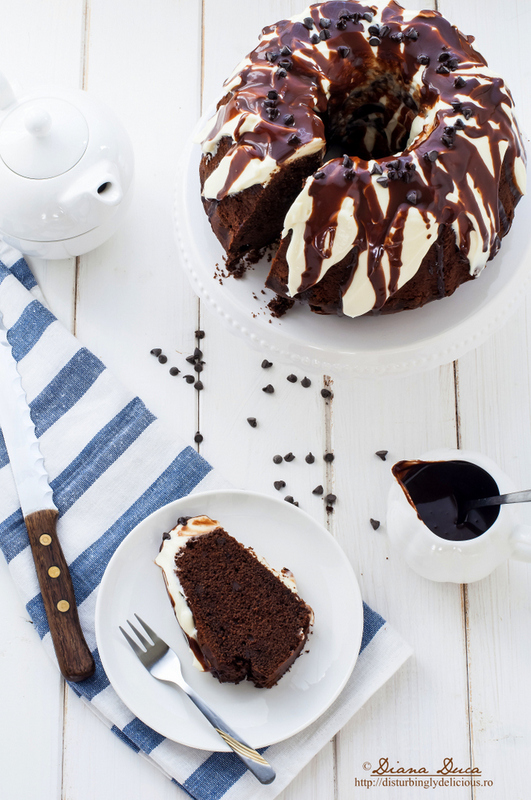 This bundt cake looks wickedly delicious.. I love all that cream cheese frosting and chocolate drizzle especially! L-as folosi pentru cupcakes, desigur! Cu ciocolata si un frosting imens si cherry on top! 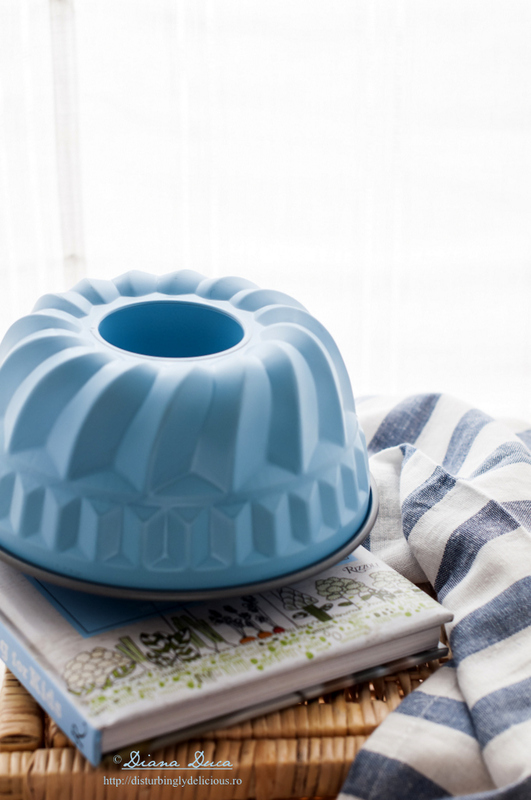 Minunat blog, minunat, bundt cake, minunat cake stand! De la cakemart mi-ar placea acest suport de tort: http://www.cakemart.co.uk/tableware-accessories/cake-stands/kitchen-craft-wire-cake-stand-cream-26-cm.html, l-as folosi pentru un tort cu muuuulta ciocolata si zmeura. Sunt demult fan DD si te urmaresc cu drag! Diana, ce premiu frumos!! M-am indragostit iremediabil. Standul l-as folosi sa adapostesc o negresa cu bezea glauzurata pe margini. L-as folosi la orice tort elegant. Am dat share la poza de concurs cu Cristina Toth. Si ar mai fi unul care imi face cu ochiul: http://www.cakemart.co.uk/tableware-accessories/cake-stands/IB-Laursen-Tortenstaender-aus-Keramik–rosa–29-x-9-cm.html. Multumesc pentru invitatie! Pfai! Pot sa mai zic ceva? Da, imi place si prajitura (mult-de-tot), imi place si tava, dar cel mai mult imi place standul:) S-ar potrivi de minune la colectia mea:). hihi. How sweet! Imi place la nebunie ce-ai pus la cale cu Cakemart. Platoul ala minunat l-as folosi in pura armonie cu un entremet cu capsune, jeleu de zmeura frisca si ciocolata. Cu aceasta folie m-as incumeta sa fac macarons. This looks amazing! What beautiful pictures!! Thanks for passing by, Kelley! Daca as avea standul pus ca premiu l-as folosi pentru tortul de ciocolata si fructe de padure pe care vreau sa-l fac pentru 8 Martie. Ce cadou frumos ne-ai pregatit! Platoul l-as folosi pentru un Gugelhupf cu lamaie si mac, numai bun de savurat langa cafeaua de dimineata. Am dat share cu numele Draghici Anca iar linkul este acesta: https://www.facebook.com/anca.draghici.9/posts/941478265862530. Premiul l-as folosi pentru un chec cu lamaie (acelasi format ca al tau). Oricum, merci de reteta de mai sus, o sa o incerc pentru ca arata prea bine! Ma refer atit la premiu cit si la gama bogata de produse oferita de cakemart.co. urind succes tuturor si o primavara frumoasa! Imi plac stand-urile foarte mult. Mi-ar placea, in plus pe langa cel pe care l-as castiga, unul pentru cupcakes: http://www.cakemart.co.uk/tableware-accessories/cupcake-stands/wilton-cupcake-stand-for-24-cupcakes.html . Premiul oferit este absolut minunat! Cel mai bine se potriveste torturilor de orice fel, mai ales ca intr-o casa cu copii orice zi e sarbatoare, deci pentru asta l-as folosi in mod deosebit! Sper sa fi parcurs toti pasii corect! Succes tuturor! O primavara frumoasa! As folosi formele minunate ca sa fac un tort mare,mare …. Sunt abonata a paginii Disturbingly Delicious de mult timp, am dat share public si tag imaginii de concurs (Luana Ana) la adresa: https://www.facebook.com/luana.ana.1612. As inaugura standul de prajituri cu un tort brownie, cu topping de frisca si capsune. Pe acest stand superb as pune un tort de ciocolata cu multe nivele. Multumim pentru premiul fain ! Foarte frumos premiul! Imi doresc de mult unul! Cred ca i-ar veni bine un tort de ciocolata! O primavara plina de bucurii sa ai! Mi-as dori http://www.cakemart.co.uk/tableware-accessories/cake-stands/rbv-birkmann-cake-stand-vintage-white-30-cm.html si l-as folosi pentru Strawberry Cheesecake pentru ca ador cheesecakeurile. Standul l-as folosi pentru un tort cu mac delicios. Diana, superba prajitura, noi iubim dulciurile cu ciocolata! Pozele sunt speciale, extrem de luminoase. Ma duc sa publicizez pe blog!!!!!!!! Inca din prima zi cand am vazut suportul tau pentru tort m-am gandit ca ar arata foarte bine si la mine in bucatarie, asa ca am hotarat sa ma inscriu la concurs. Like la pagina ta am dat de ceva vreme cu numele Roxana Pal si am dat si share la imaginea cu link la Giveaway de pe pagina Disturbingly Delicious pe profilul meu, https://www.facebook.com/roxana.pal.3/posts/10205706646402939. Sincer inca nu m-am horatat ce desert as vrea sa fac pentru a-l prezenta pe suportul asta, dar cred ca cel mai tare ma tenteaza un tort cu multa ciocolata, probabil un Chocolate Cake sau un tort Sacher. Oh draga mea, cred ca mi-ai citit gandurile! De vreo 2 ani caut un suport de tort din portelan cu picior pentru torturile mele, mai mult sau mai putin etajate, care au macar cate o figurina care troneaza on the top…pana acum nu am reusit sa gasesc ceva care sa imi placa si sa fie potrivit pentru fotografiile pentru blog…asa ca raspunsul meu este simplu, as alege acest minunat suport cu o cupola atat de frumos bombata incat incap pana si decoratiunile mele si pot fi bine protejate in interior…so,please fingers crossed for me! Pe stand ar trona cupcakes delicioase cu ciocolata si zmeura. Astept alt concurs. Pe asta l-am ratat.